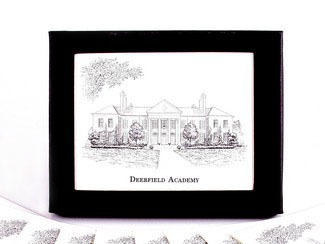 Deerfield Academy notecard sets designed by Eglomise from photographs of the Main School Building. 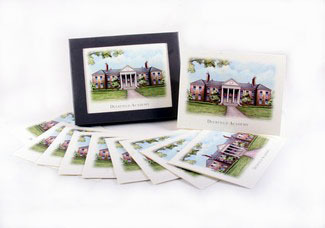 Set of 10 4 1/4" x 5 1/2" blank notecards attractively packaged in a grey box with the design on the cover. DEERFIELD ACADEMY is printed below the image. Available in traditional color or antique styles. Perfect for thank you notes or announcements.